Super Smash Bros. Ultimate Direct Recap | Nerd Much? Series director Masahiro Sakurai greeted us bright and early today for a special Super Smash Bros. Ultimate Direct. And in a relatively short time span, we got a ton of new information on the next installment of the series. 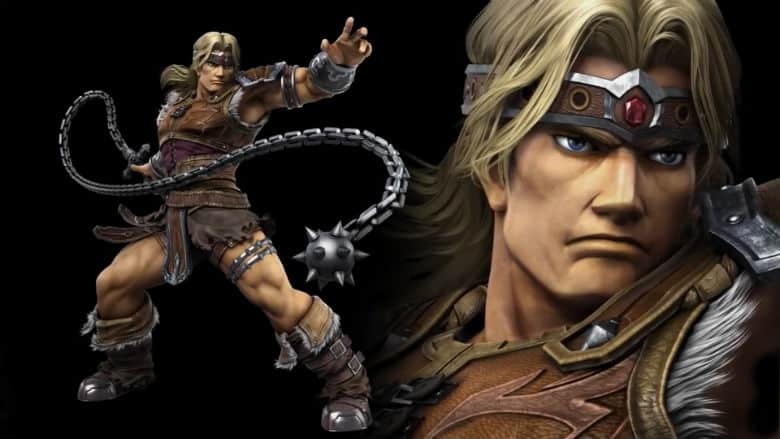 The Direct started out with a moody character introduction which confirmed that Simon Belmont is the next 3rd party character entering the series. The character will mainly utilize his holy whip. The item will have the longest reach outside of projectiles in the game, and Belmont can move it in any direction. Konami’s character can also throw axes, crosses, and holy water too. Richter Belmont was also confirmed to be an Echo character to Simon. And the Castlevania: Symphony of the Night version of Alucard will be an Assist Trophy in Ultimate. The Belmont stage in the game will be a version of Dracula’s Castle. And within it, we’ll be encounter numerous bosses from the series including Frankenstein, the Grim Reaper, Werewolves and more – even Dracula himself from time to time. Sakurai also confirmed that there will be an astounding 34 music tracks just from the Castlevania series alone. There were other Echo fights announced alongside Richter Belmont. Dark Samus is joining as a clone of Samus. And Chrom from the Fire Emblem series is entering as a clone of Roy. Sakurai stated that you can choose how to display Echo fighters in the game’s menu. You can either have them stacked atop the character their echoing in the character selection screen, or have them spread out within their own character selection box entirely. The Super Smash Bros. Ultimate Direct then went over the stages within the game. There are an astounding 103 in total. And with each stage having Omega and Final Destination versions, that adds up to over 300 total stage options. Sakurai revealed a new one today too. It’s one you might have expected – New Donk City Hall. Sakuraki also showcased a new feature that they call Stage Morph. At stage selection, you’ll be able to choose 2 different stages for your match. As you fight, the stage will periodically (at a time interval you can choose) morph between the two different stages you selected. The sheer amount of music in Ultimate is incredible too. Over 900 tracks are included with the game. And in the My Music mode, you can create your own playlists and modify which tracks will play on which stage. You can even listen to your playlists while your Nintendo Switch screen is shut off. You now have the ability to further modify your rule set during versus matches. Stamina Battle is now an option, and stage selection will come before character selection this time around. You can also turn on the ability to charge up weaker versions of Final Smashes during bouts so make them an integral part of combat. In today’s Super Smash Bros. Ultimate Direct, Sakurai also introduced Squad Strikes which is a 5 v. 5 or 3 v. 3 team battle mode. Tournament and Training modes returns. And Smashdown is a new mode where you and your friends battle with the entire Ultimate roster – however, each character can only be used once across your entire group. A bunch of new items were shown off. As were new Pokémon in Alolan Exeggutor, Abra, Solgaleo, Lunala, Mimikyu, Pyukumuku, Vulpix , Alolan Vulpix, Marshadow and Ditto. Ditto may be the coolest, as it takes the form of the fighters on the stage and dishes out damage as a mirror version of themselves. New Assist Trophies debuted too. They include Zero, Knuckles, Krystal, Klaptrap, Kapp’n from Animal Crossing who will run you over with his bus, , Chef Kawasaki, Gray Fox, Nikki, Shovel Knight, Moon, Bomberman and Monster Hunter‘s Rathalos. Rathalos the first character to be included in the game as both a boss and an Assist Trophy. The Super Smash Bros. Direct then wound down with a quick look at the main menu screen. The Smash mode is most prominent, but just below it is another main mode for the game that was blurred out. Sakurai says “We can’t talk about that just yet.” But as the game’s director finished speaking, heavy footsteps could be heard in the background. We then got our final character introduction of the day: King K. Rool. Donkey Kong’s nemesis got a CGI trailer to showcase his debut. 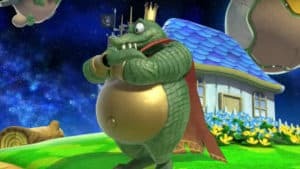 We then saw a bit of his move set which includes firing cannonballs, a helicopter aided jump, blocking attacks with his gut, a boxing gloved heavy punch, using his crown as a horizontal projectile, and smashing foes into the ground just ask D.K. does. All it in all, the Super Smash Bros. Ultimate Direct delivered with a ton of content. Hopefully we’ll hear about the title’s hidden game mode soon ahead of the game’s December 7th release.